Funky Hotel Building Optical Illusion! True optical illusion fanatics can’t get enough of hidden and impossible objects, and seemingly bent images. Some are such fanatics that they live and breathe optical illusions! They make even incorporate them into their work. Here’s what you might get if an optical illusion fanatic becomes an architect…. 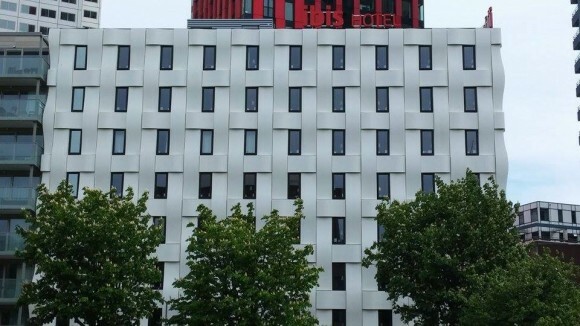 This building optical illusion is actually the front of the Ibis Hotel, located in Rotterdamn, Holland. 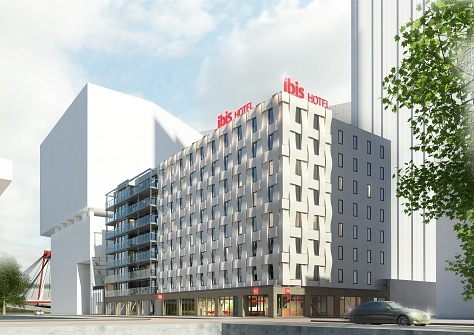 This modern hotel was built in August 2014 along the waterfront of Wijnhaven harbor. I’m not sure if it was the architect’s intention or not, but he certainly creating an interesting building optical illusion! If you look at this building optical illusion straight on, what’s the first thing you notice? Do the windows look crooked or sloping? It’s pretty hard to tell, right? Look a little more closely, though. You’ll notice that the height of the windows are the same on both sides of the buildings. The distance between the tops of the windows and the bottoms of the windows above it are also the same. If you don’t believe me, use a ruler or piece of paper to measure it. You’ll see that the lines are not, in fact, sloping at all and this is nothing more than a building optical illusion. Think this looks familiar? You’re right! It bears a striking resemblance to the classic sloping lines optical illusion. It makes me wonder, though. If someone was actually trying to create a building optical illusion, what kind of flooring was used? Do they look like this? Does the building have impossible rooms?? I have to see this place! Nice find! Architectural illusions are great. it looks not straight.the line is straight use a paper or a card on the fame.